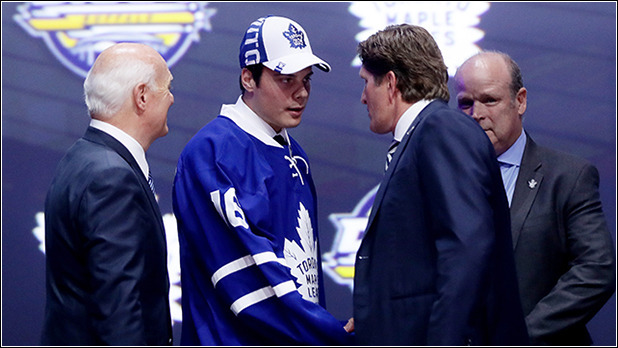 The Toronto Maple Leafs have resisted the temptation of a quick fix over the past few years. Unlike previous regimes that promised to be patient and then jumped the gun by making a big trade that cost them youth and draft picks, president Brendan Shanahan and general manager Lou Lamoriello continue to build through the draft. If Toronto remains on that path, homegrown talent will ultimately form the nucleus of the Maple Leafs when they make the Stanley Cup Playoffs. The future of the Maple Leafs is directly tied to Shanahan’s vision. A strong personality, Shanahan was not intimidated by bringing other powerful voices into the mix, including coach Mike Babcock and Lamoriello. Shanahan is a proven winner, as are his coach and GM. Lamoriello said his initial goal was to bridge the gap between entitlement and responsibility on and off the ice. He may be old-fashioned in his handling of players, but discipline was needed and Shanahan knew Lamoriello was the man for the job. The Maple Leafs paid a premium to get the man they considered to be the best coach in the world. Toronto finished 30th in the NHL in Babcock’s first season, but there was a noticeable improvement in play and discipline. Babcock is very rigid in how he wants his players to perform, and that can grate on the nerves of veterans. However, with Toronto predominantly a young team, the coach has a captive audience. Babcock has very high expectations of his players, and those who do not toe the line will not be tolerated. There is a reason Babcock has been invited to coach Team Canada for the World Cup of Hockey 2016 and why he was behind the bench for the past two Olympic gold medal teams: He gets the most out of his players. Coming off a season when he shared the William M. Jennings Trophy for allowing the fewest number of goals (with Anaheim Ducks teammate John Gibson), the Maple Leafs believe Andersen is the answer to their goaltending concerns. They were so convinced of that, they traded the No. 30 pick in the 2016 NHL Draft to acquire him from the Ducks. Andersen (6-foot-4, 220 pounds), who will be 27 when the season begins, is entering the prime of his career and will be given every opportunity in Toronto. He began last season 0-6-1 when the Ducks struggled but wound up 22-9-7. If the Maple Leafs continue to improve defensively, Andersen will be a big part. For years it was said Maple Leafs fans would never put up with a tear-down and rebuild. Nothing could be further from the truth. Leafs Nation has grown frustrated with quick fixes that simply did not work. Shanahan and his group have made it very clear to the fans they will not do that. Fans watched patiently last season when prospects were inserted into the lineup and gave them a glimpse of the future. Perhaps not all the young players will make the Maple Leafs, but there were enough quality performances to conclude the organization is moving in the right direction. 1. How soon can the young nucleus contribute? Forwards Auston Matthews, William Nylander and Mitchell Marner have been projected to be elite scorers in the League. How quickly they become impact players will play a huge role in how quickly the Maple Leafs return to the playoffs. Matthews will likely get the chance to be the No. 1 center, and centers Nylander and Marner could start off playing wing. The Maple Leafs ranked 28th in goals last season (192) and could use a boost on offense. Forward Josh Leivo, on the bubble to make the team after signing a two-year contract, had five goals in 12 games last season. Veteran left wing James van Riemsdyk will make a healthy return after missing 42 games with a broken foot. 2. Can Frederik Andersen give the Maple Leafs a minimum of 60 games? Andersen split the workload with Gibson in Anaheim last season, when most of the best goalies in the NHL were playing 60 or more games. Braden Holtby, winner of the Vezina Trophy as the League’s best goalie, played 66 games for the Washington Capitals. That will be the expectation for Andersen this season. In three NHL seasons, Andersen has appeared in 28, 54 and 43 games. Playing behind Babcock’s defensive system, a minimum of 60 games should be doable. 3. Will a leader emerge? Toronto did not anoint a new captain after Dion Phaneuf was traded to the Ottawa Senators on Feb. 9. There has been some sentiment that fourth-year defenseman Morgan Rielly would be a suitable replacement, but he is 22 years old and the Maple Leafs don’t seem eager to give the role to such a young player. It could be they will wait for Matthews to establish himself and then name him captain, in the way the Edmonton Oilers seem to be waiting for Connor McDavid to grow into that role.